Yesterday over 60 Goodwill Journey supporters showed up for the Glow In The Dark Charity Cycle event to raise awareness for Wisam’s journey around the world. Cyclist from every age paddled across the Dubai desert for a 15km trek with some completing a 30km round trip journey. This cycling event was meant to raise awareness about the Goodwill Journey and the effort Wissam is putting through as he drives throughout the world on his motorbike in support of the PCRF. 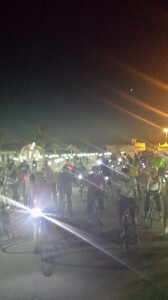 The event took place at the beautiful Al Qudra Cycle Path just outside of Dubai and most completed the journey in less than 2 hours. Wissam is riding for the hundreds of thousands of sick and underprivileged children in the Middle East. He is working with Palestine Children’s Relief Fund (PCRF) and his ultimate goal is to raise funds for the building of children’s hospitals and for medical missions across the entire Middle East region..